We have a Wordpress blog and although we are updating it regularly we don't seem to be connecting with our audience. What tips and tricks can you recommend that will allow us to grow our community and take our content to the next level? Answer: Whether you manage a blog for business or pleasure the end is the same: you want people to read that blog! It's a crowded marketplace out there; check out these stats on the number of Wordpress blogs and blog users alone as of August 2012 courtesy of Blogging.org. First off, congratulations on your regular content creation strategy! Updating your blog regularly is a great first step. But it's not enough. Everyone is putting up quality content. You need to work on promoting that content, publicizing your blog, and connecting with your audience. So how do you stand out? 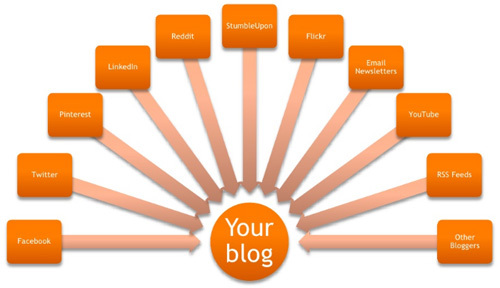 Here are some tips that we use on our own blogs or the blogs of our clients. We know they'll work for you as well! Blog Marketing Secret #1 - Make it your Social Home Base. It's amazing how many people don't use social profiles to virally share, link or promote their blog content to existing audiences. As we've covered previously in SearchEngineNews, every time you update your blog you should be updating and pushing that content out to your various social channels. Again, no one will know your blog exists unless you actually tell them!